Just Cause 4 is part superhero game, part comedy gold mine, and all chaos. 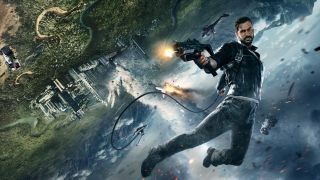 The series has always let players run wild in its open-world sandboxes, wreaking havoc or just fooling around with the impressive physics that govern everything in the game - but with a host of new upgrades to its trademark grappling hook, Just Cause 4 ratchets up with the ridiculousness to new heights. Rico Rodriguez is back, taking the fight to the Black Hand - a private military company - on its home turf: the fictional island of Solis, where extreme weather conditions run rampant across all kinds of terrain. It's been three years since the events of Just Cause 3, and Rico's going toe-to-toe with the patricidal Black Hand general Gabriela Morales, recruiting a force of his own: a group of freedom fighters who call themselves the Army of Chaos. I recently got the chance to get some extensive hands-on time with the latest adventure from Avalanche Studios - a few hours early on, then a few fast-forwarded to much later in the campaign - and I was stunned at what's possible with all the upgrades to Rico's arsenal. Between completing missions and messing around with the chaotic god that is Rico's grappling hook, I got up to some pretty absurd antics amidst all the customary firefights and explosions. These seven anecdotes seem to be but a tiny fraction of what's possible in Just Cause 4's sprawling playground, with Rico effectively having the powers of flight (thanks to this zippy grappling hook and wingsuit) and telekinesis (courtesy of all those tethers). Sadly, capturing gameplay footage wasn't an option, so you'll just have to imagine these moments for now - but you can always reenact them when Just Cause 4 hits PS4, Xbox One, and PC on December 4. Extreme weather conditions are a pillar of Just Cause 4's story and setting - and the tornado is literally the cover disaster, featuring prominently on the box art and in trailers. Each of Solis' four distinct biomes has its own occurrence: tornadoes in the grasslands, sandstorms in the desert, blizzards in the alpine, and tropical storms in the rainforest. I happened to spot a tornado spinning across the grasslands after I raided a facility linked to Project Illapa (pronounced 'ee-yapa') that could be causing these phenomenon for sinister means. The in-game tornadoes are awesome forces of nature, looking impressively imposing as they churn wind into a spinning frenzy and whip up every nearby object that isn't cemented to the ground. Of course, the first instinct when encountering such a natural disaster in-game is to drive straight into it, Twister-style. Flooring it into the eye of the storm is a mistake, as your vehicle - with Rico inside - will quickly be destroyed by careening debris. But amazingly, Rico can use his trusty parachute and wingsuit to get major air off the tornado's currents, provided you're ok with constantly getting sucked in toward the middle. It's still dangerous, of course: Rico will enter a ragdoll state if something smacks into him inside the storm. And with the ability to stay curled up in the fetal position by holding down the B button once you've started ragdolling, I was able to make Rico's wind-ravaged body circle the tornado for what felt like a hilarious lifetime. Best of all, I lived to tell the tale after gliding to safety once I had wrenched myself away from the hypnotic spinning of poor ragdoll Rico. As Rico completes missions for his allies on Solis, he'll slowly expand the numbers and territory of the Army of Chaos. Once you've caused enough chaos around the island - usually by blasting Black Hand facilities to smithereens - you'll have to the option to push back on enemy borders to expand your territory (and open up new avenues for fast travel). As an added bonus, the empowered soldiers in your army will often show up to help in the fight against Black Hand mercenaries, provided you're not already the one bailing them out of a bad situation. Now, I'm going to chalk this up to getting acclimated with the controls, but I may have accidentally murdered an Army of Chaos ally who was coming to my aid. When aiming your targeting reticle at a vehicle, it'll be color-coded to denote friend (green) or foe (red). But I wasn't paying attention to the reticle's green hue when I used Rico's grappling hook to zip up to an allied chopper and commandeer it for myself, tossing the friendly pilot out screaming in one smooth motion (akin to the "Get out" scene from Terminator 2). Sorry about that, buddy - I'd airlift you to the nearest hospital if I thought it would help! One of the primary questgivers you'll encounter on Solis is Javi, an archaeologist studying the indigenous people who once resided in the island's rainforests. Javi hopes to use his findings for a greater good - but really, it's a perfect excuse for Rico to run amok and raid some tombs. Whenever you sync up with Javi, he'll point you in the direction of burial grounds related to the court of Otorongo, an ancient leader who was nice enough to build giant tombs for his servants. Getting to the relics that Javi wants usually involves a giant physics puzzle, free from the gunfire of the Black Hand. One such mission made great use of the tethering function on Rico's grappling hook. After exploring a cave and slamming my head into a stalactite due to an ill-advised grapple, I had to pull a gigantic wooden lever (go figure) by tethering it to the ground, which freed a colossal Olmec head the size of an Indiana Jones-chasing boulder. After narrowly avoiding death by flattening, I followed the head into the pit it plummeted into, where a giant hole in the ground seemed like a perfect fit. By using the tether ability once more, I pulled the Olmec head into place like a big ol' key, unlocking a stone mechanism to grant Javi access to historical secrets. Finally, all those years watching Legends of the Hidden Temple paid off. This feature will be a godsend for the physics wizards who will inevitably turn Just Cause 4 into a string of compilation-worthy stunts and shenanigans. Rico's grappling hook starts out simple enough, but as you complete missions, you'll unlock upgrades and mods that let you customize the hook's potential to an absurd degree via its three distinct parts. The balloon-spawning Air Lifter evokes Metal Gear Solid 5's Fulton system, the Retractor lets you yank tethered objects towards each other, and the Booster adds a rocket-powered thruster wherever you so choose. Within each segment, there are even more variables you can fiddle with, all with a range of settings. For instance, you can set how high you want the Air Lifter balloons to rise, whether they'll hover or explode once they top out, and how fragile they are (including the option to make them invulnerable to your bullets, enemy bullets, or everything altogether). The reported millions of possible combinations for grappling hook loadouts are mind-boggling, and while you can adjust them at any time by pausing, Just Cause 4 is kind enough to give you three loadout slots you can switch between on the fly with a tap of the D-pad. You can fire out up to 10 tethers at a time, with the ability to deactivate them individually or banish them all in one fell swoop. Now you can have a grappling hook for any occasion, whether you want to send a tank up to the sky or convert a shipping container into a rocket-boosted battering ram. Is it human nature to want to torture virtual bad guys when presented with the physics to do so? Do we all harbor a deep darkness within us that just wants to put ragdolling enemies through hell? I'm not qualified to answer those questions, but I certainly can't resist the chance to string up Black Hand attackers in horrifying ways after they've opened fire on me. I attempted to have one poor sap drawn and quartered, attaching separate Retractor tethers to his arms and legs until he was strung up like a morbid puppet. Just Cause 4 may be rated M for Mature (or PEGI 18 if you're in the UK), but fortunately it has the sense to not let you rip an enemy limb from bloody limb with the power of physics. I also used the Air Lifter balloons for an incredibly creepy effect: haunting myself with the floating corpses of my victims. One of the Air Lifter mods allows you to tune how you want the balloons to behave: floating straight up, drifting towards your aim, or following you around. The general idea is that you can airlift a few explosive barrels over a target, then pop the balloon and rain down fire on your enemies. But my methods were much more macabre: I attached 'Follow' balloons to the bodies of my slain enemies, resulting in Rico being followed by a procession of physics-governed ghosts. Does that make me a sicko? I cannot say. If there's one gripe I have with Just Cause 4 after spending quality time with it, it's that some of the missions feel too bland compared to the wanton chaos that's prevalent throughout the rest of the game's systems. And a particularly unenjoyable objective, which I encountered multiple times, is "guard this destructible data tower while swarms of Black Hand goons show up to shoot at it." Yes, it's exciting to hold out against waves of enemies - but too often, I found myself babysitting the objective when all I really wanted to do was zip all over the place shooting up distant bad guys, or hijacking an enemy chopper just for the hell of it. Sadly, such a cavalier attitude will often leave the objective unattended and vulnerable, where it'll be pulverized by flying drones or Black Hand mercs carrying rocket launchers. These hold-the-fort missions also feel like they take too long to complete - though that's probably just my impatience talking after repeat failures or having the tower get destroyed at the last possible second. Fortunately, Just Cause 4 takes mercy on anyone struggling to complete laborious missions, eventually reducing the time requirements for success or dropping you midway at a checkpoint. With the power of developer debug commands, I was gifted two extremely powerful weapons from late in the game: the PWC V4.2 Wind Gun and the DA 9.3 Lightning Gun. In a welcome addition, every gun in Just Cause 4 now has two modes of fire, and the alternate fires typically deliver explosive results (like a stun grenade on a shotgun, or a quick multishot on the grenade launcher). In the case of the Lightning Gun, the primary fire is a sci-fi style beam of crackling electricity, letting you reduce enemies to ash - but the alternate fire is even wilder. The Lightning Gun comes equipped with grenades that will cause a miniature, localized thunderstorm in the area, fatally zapping enemies caught in its wake. Of course, that lethal electricity doesn't discriminate, and on multiple occasions, I inadvertently turned Rico into a crispy hot dog after being struck by insta-kill lightning bolts intended for my enemies. Meanwhile, the Wind Gun is an utter delight, letting you bowl over people and objects like a supercharged leaf blower, with a pulse-blast alt-fire that sends everything in front of you soaring into the sky, not unlike Team Rocket blasting off again. For more open-world goodness, check out our curated list of the 25 best open-world games to play right now.